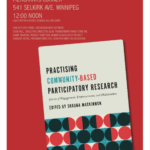 Practicing Community-Based Participatory Research. Edited volume (Editor: Shauna MacKinnon) of Stories of Engagement, Empowerment and Mobilization. Light Refreshments Service, All Welcome!